Lofoten needs to be seen to be believed. Basking within the icy flourish of the Arctic Circle is a jagged shoal of islands harbouring a secret. Happiness lives in this wild place, a calm contentment and sense of belonging nurtured by respect for 1000-year-old traditions. The Lofoten Islands wallow off northern Norway. This warm-hearted Gulf Stream-bathed chain lies within the cold body of the Norwegian Sea. 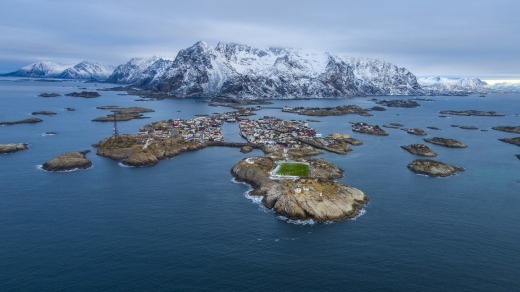 Only 24,500 people live along the 110-kilometre string of five main islands at the southern end of the Lofoten-Vesteralen archipelago in Norway's Nordland. And yes, they are materially rich – about 13 per cent of them are millionaires ("nice millionaires", according to our guide), the highest proportion in Europe, and the low unemployment is a northern Norwegian record. But financial success is simply a byproduct of Lofoten tradition, which, salted with a dose of contemporary wisdom, is the wellspring of island happiness. It's all about the fish, the light and the bovine lingerie. This we learn on our five-island sweep, beginning in Svolvaer, Lofoten's unofficial capital on Austvagoya Island in the north-east and tracing south-west across Gimsoya, Vestvagoya, Flakstadoya, and Moskenesoya islands. The Vikings named this place Lofoten, meaning lynx foot, for its shape. 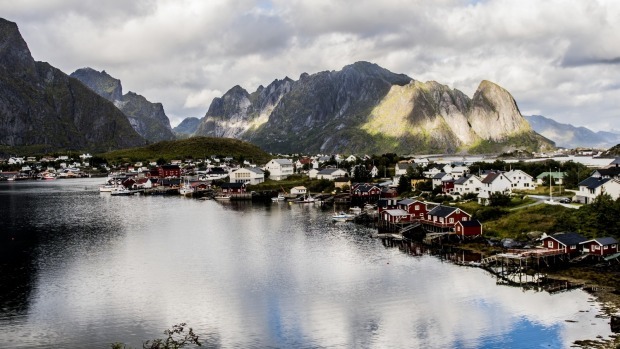 It would be easy to simply focus on Lofoten's utter beauty – the darkly architectural gneiss and granite volcanic mountains, eroded summits of a submerged mountain range; the startling, ice-white sand beaches and turquoise waters, the painterly landscapes that lure artists chasing "the hour of the wolf", when the Nordic world turns a rich shade of blue beneath the polar night. But we are fortunate to have a local guide who colours in this scenic world with stories from the ages, emphasising the islands' cherished original ways. He begins with the customs surrounding the migration of the Norwegian Arctic cod or "skrei". In winter, they come in their millions from their Barents Sea summer grounds, turning the sea between Lofoten and the mainland into the world's largest maternity ward. Females each lay between two million and nine million eggs, though only between four and 20 eggs make it to maturity. Cod can live to 40 and make the 1600-kilometre round trip each year to Lofoten. This natural phenomenon, the world's largest cod harvest, is the root of Lofoten's wealth, its settlement, its customs and its contentment. The Viking sagas tell of the richness of the cod, fished with bone hooks. They tell of how Borg on Vestvagoya (Lofoten's most populous island, now producing more meat and milk than anywhere in northern Norway) was an important trading centre, along with Oslo (known as the Cove), Trondheim and Bergen. They tell of how people dried the cod on open racks, as they still do today. Lofoten's low temperatures and humidity, constant wind and paltry rainfall aid the drying, which takes place in one big winter open-air refrigerator. No salt is used. It is the cold-resistant bacteria that dry the fish, which, once dried, become stockfish. The cod is hung in mid March and taken down three months later before the insects come. Scarecrows frighten the birds but clever otters can climb the racks and cut the rope securing the cod bunches. Stockfish comes only from the cod body. Heads are dried separately and ground for fishmeal or fertiliser. One kilogram of dried fish has as much nutrition as five kilograms of fresh. Stored properly it will last 10 to 12 years, sometimes 15, and 90 per cent is exported to Italy and Africa. A strict quota system ensures the cod's sustainability and everyone works to benefit, even the children, generating a sense of pride and ownership. The customs of cod fishing and preparation are passed down through generations. By the age of six, all children can fillet a fish in minutes and are experienced fishers. Traditionally, the delicacy known as cod tongue is the preserve of the children. They cut the cod tongue – a tongue-shaped part of the neck – after school throughout winter, earning handsome sums. A 13-year-old can cut up to 30 kilograms in an evening and 100 kilograms in a day, yielding 6000 Swedish krona or about $900. Cod tongue does not have a fishy taste, says our guide, positively slavering. They are flour-dusted and pan-fried until crispy, tasting like chicken. Clever adaptations from traditional ways have upheld the standard of living here, with many of the stilted "rorbus", or fishing shacks, that fringe the island refurbished into comfortable accommodation. From an early age, all Lofoten Islanders learn the wisdom of the land. This means people stay deeply connected to their place, despite being a highly computer-literate society. Teenagers still love to feel the ground under their feet, experience the shifting winds and hike in the mountains. They know what grows where. They can gather a salad of wildflowers – the celery-like angelica, cow parsley that tastes like carrot and the tart yarrow. They know the uses of fireweed or rose bay willowherb. They know when the fish come – cod in winter, herring in autumn – when the orcas arrive to stun the fish with a flick of the tail, forcing some to strand themselves where they can be gathered like corn or apples. They know where to find chanterelles and cloudberries and they harvest them as their ancestors did. Crime is low – the rescue of a ladybird from a floating twig is a half-page spread, a fox in an abandoned Volvo a front-page story. The land yields so richly that the island cows produce so much milk – up to 60 litres a day – their udder extensor ligaments stretch, and to avoid stepping on their own udders they have to wear special cow brassieres. Lofoten's lightly salted lamb, from seagrass and meadow grazing, is considered some of Europe's best, and four months of continuous light has launched a 1.5-metre Lofoten dandelion into Guinness World Records. Artist colonies have sprung up and we visit a Vikten glassblowing studio and Borg's Lofotr Viking Museum, which was reconstructed atop what excavations showed to be the largest Viking-era longhouse in Norway. We lunch at the World Heritage-listed fishing village of Nusfjord and visit, at the end of the islands, the gorgeous, colourful town of Reine, where we rejoin our ship, APT's MS Island Sky. On our journey we have occasionally caught the intense waft of dried fish that the locals appreciate, as it represents "the smell of money". Meanwhile, there is some concern that the tourists (one million in 2017) bringing their own smell of money will harm the pristine environment of these happy isles that through good fortune and sustainable management have boomed since the Vikings. Lofoten's Rost Reef is the world's largest known deep-water coral reef, measuring 35 kilometres long and three kilometres wide. No trawling permitted. Excavations at Borg reveal that Vikings used colour to denote status – pink and blue were Viking Prada. Men also dyed their hair blond and used kohl eyeliner. Hygiene was important, with tools to clean ears discovered. Lofoten's Icelandic horses are descendants of Viking steeds. Icelandic horse treks are one way to absorb the beauty of the islands. Beyond the last island lies the Moskstraumen whirlpool that Edgar Allan Poe wrote about in his 1841 short story A Descent into the Maelstrom and Jules Verne used in his novel Twenty Thousand Leagues Under the Sea. Lofoten's huge, beautiful white-tailed sea eagles are worth seeing so book a tour.